BRUNEI’S junior paddlers did not have a good start to their 21st South East Asian Junior and Cadet Table Tennis Championship in Kuala Lumpur on Thursday. The country lost to Indonesia, Malaysia and Singapore with a score of 3-0 on their first day of the team event at the Gymnasium 2, National Sports Council Bukit Jalil, Kuala Lumpur. However, despite losing all the games in the team event, it was a different story for Brunei in the Cadet Single Boy Under-15 event where Ak Abd Basheer Pg Hj Mohammad managed to get a comfortable 3 - 0 win over a player from the Philippines. Despite the losses in the team event, national coach Tjautr Budisetiojono was full of praise for his young players as they gave their opponents a good fight. “The players put in a strong performance, especially against Singapore,” said Tjautr. “Our players were the smallest but they could compete. “The oldest Bruneian player is 15, but those from other countries are 18,” he added. Tjautr also shared that Brunei’s opponents have more experience and exposure compared to the Brunei athletes. “We gave the opponents a good challenge,” said the Indonesian. “However it was still difficult as Singapore, Thailand, Vietnam and Malaysia have more experience than us as they regularly join international and regional competitions,” he explained. Abdul Wafi Suhardi and Ak Abd Rasheed Pg Md Noor are scheduled to compete in the doubles event today. 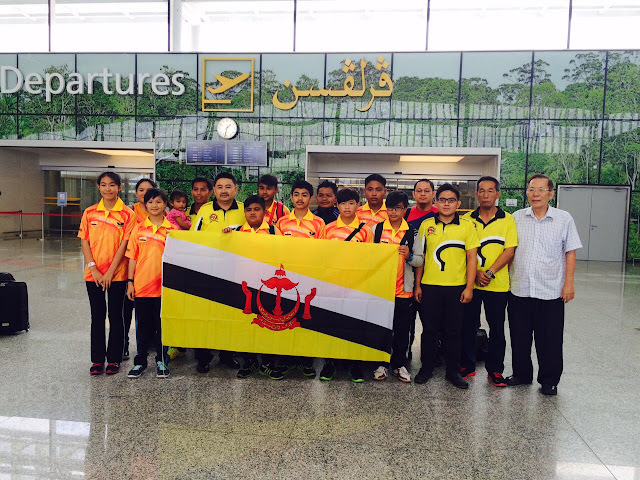 BRUNEI’S young paddlers have entered the quarter-final of the 21st South East Asian Junior and Cadet Table Tennis Championship at the National Sports Council Bukit Jalil, Kuala Lumpur, yesterday. Ak Abd Basheer Pg Hj Mohammad Noor has entered the quarter-final after clinching the second spot in the Cadet Boy Single category. He beat his opponent from the Philippines 3-0, although he went down to a Malaysian player. His compatriot Abdul Wafi Suhardi, played in the Junior Boy Single category, also reached the quarter-final, after defeating a Laos player 3-0. The players have shown a remarkable improvement compared to the 20th South East Asia Junior Table Tennis Championship 2014, which was held at the Indoor Stadium in Berakas last year. “This is the first time that our players managed to get pass through the group stage, so I am very pleased with it,” he added. “Despite being the youngest competitors, their performances are really impressive,” he said. Both players are scheduled to compete for the next round today.